The president previously decried influence of foreign lobbyists. This article was co-published by TIME, Salon, Reveal, Public Radio International and Philly.com. A private consultant shepherding President Donald Trump’s Department of Homeland Security secretary nominee Kirstjen Nielsen through her U.S. Senate confirmation process has also lobbied the homeland security agency on behalf of the Panamanian government. Thad Bingel, who is guiding Nielsen through the confirmation process, worked as a registered foreign agent representing Panama’s interests to the Department of Homeland Security from February 2012 to the end of 2013, according to federal records reviewed by the Center for Public Integrity. Lobbying on behalf of foreign governments is perfectly legal, but Trump has been especially critical of such advocacy in vowing to “drain the swamp” and limit the influence of special interests. Upon taking office, Trump signed new ethics rules banning administration officials from ever lobbying on behalf of a foreign government, although those rules wouldn’t apply to volunteers such as Bingel. Asked whether Bingel had agreed to limit future lobbying of the Department of Homeland Security, Hansen said he had. 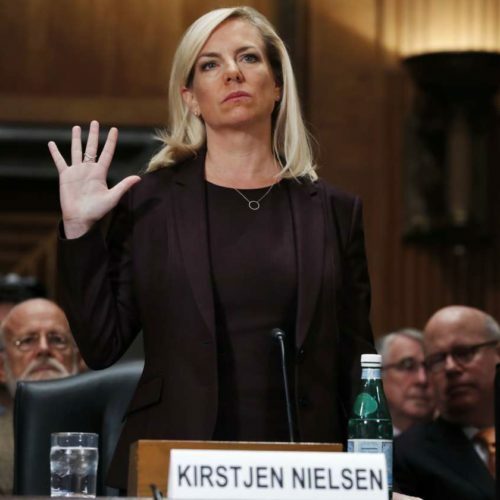 Bingel “has agreed to forego/limit his lobbying of DHS as a condition of his volunteer work for Ms. Nielsen’s nomination,” Hansen said, though he said additional details about the conditions Bingel agreed to would have to be released by the White House Counsel’s Office. Bingel’s volunteer work with Nielsen during the confirmation process has already spurred one ethics complaint against Nielsen from a nonprofit watchdog group. The complaint, filed by the nonpartisan Campaign Legal Center, accuses Nielsen of potentially violating the Antideficiency Act, a law that says federal employees “may not accept voluntary services for the government” except as provided by law, or executive branch gift rules. The Campaign Legal Center also alleged in its complaint that Bingel’s company, Command Consulting Group, represents companies that seek lucrative contracts from the Department of Homeland Security — a potential conflict of interest. Having unpaid volunteers serve as so-called “sherpas” for Cabinet nominees is more typical during a transition between administrations, current and former Department of Homeland Security officials told the Washington Post. 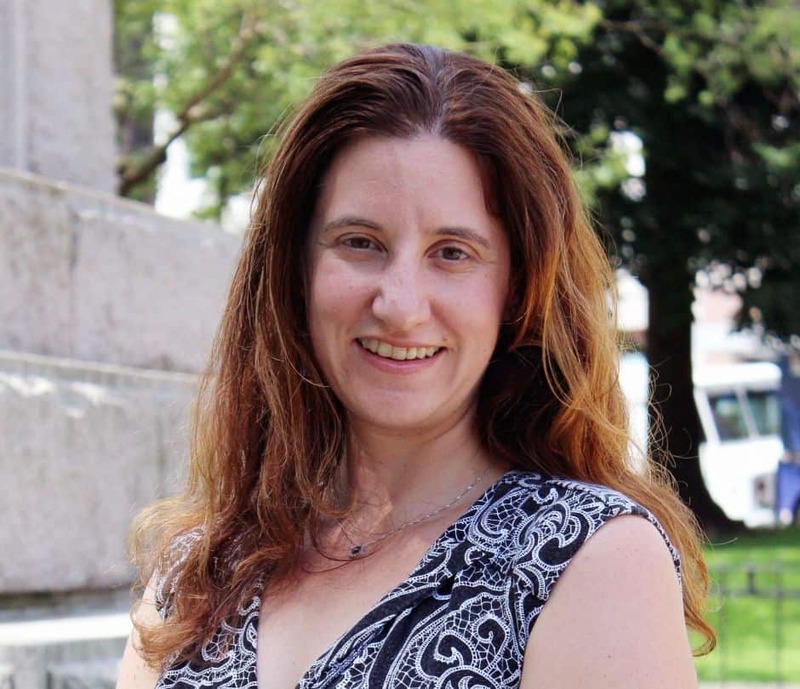 Bingel’s current role, first reported by CyberScoop, is described as unusual by former government officials. “Placing somebody in the role of leading or appearing to lead the confirmation preparation process when that person has business in front of the department is just an extraordinarily problematic approach,” said John Cohen, a former acting undersecretary for intelligence and analysis at the Department of Homeland Security and current Rutgers University professor. “There is nothing inappropriate, or new about an individual volunteering their time to help prepare a nominee for his or her Senate confirmation process,” White House spokeswoman Lindsay Walters said in an email. Nielsen is expected to receive a confirmation vote in the Senate this week. Bingel’s work on behalf of the Republic of Panama was disclosed in required filings with the Department of Justice at the time. In federal disclosure filings triggered by the firm’s work on behalf of Panama, Command Consulting Group said bluntly that Panamanian officials asked the firm to help with “arranging appropriate meetings” with Department of Homeland Security officials “once they learned of our close connections” with the department. In the federal filings, Command Consulting Group said it was already a consultant for Panama, and agreed to help set up the Department of Homeland Security meetings without charging additional fees. The disclosure filings show the Panamanian government paid Command Consulting Group more than $1.9 million between February 2012 and October 2013. Bingel was one of the people helping Panama, according to filings with the Department of Justice. Command Consulting Group said in one filing that it “arranged meetings with government agencies” on behalf of Panama in 2012, but didn’t give details about who the Panamanian officials met with or who the firm contacted on Panama’s behalf. Command Consulting Group’s final filing with the Department of Justice came in September 2014, when the firm said it was no longer providing “reportable” services to Panama. Bingel is also a close associate of one of Trump’s advisers — White House Deputy Chief of Staff Joseph Hagin, who co-founded Command Consulting Group, where Bingel is a partner. Hagin resigned from Command Consulting Group in December 2016, according to his federal financial disclosure form. Hagin disclosed his former employment with Command Consulting Group on his federal financial disclosure form, the data from which was included in the Center for Public Integrity’s #CitizenSleuth database. Journalists from the Center for Public Integrity and Reveal from the Center for Investigative Reporting noted Hagin’s connection to Command Consulting Group when reviewing #CitizenSleuth data. Both Hansen and the White House said Hagin was not involved in asking or recruiting Bingel to assist Nielsen. The White House press office did not immediately respond to a follow-up message Monday night requesting details on the limitations on future lobbying Bingel’s spokesman said he has agreed to. Hansen said Bingel has not been registered to lobby on behalf of a domestic client since 1999. During Trump’s presidential transition period, Nielsen and Bingel worked together as “sherpas” for John Kelly, Trump’s first secretary of homeland security. Kelly is now White House chief of staff, and Nielsen is his deputy. She declined to provide a copy of the White House Counsel’s advice, according to Cyberscoop. In addition to Hagin, another White House official — Director of White House Information Technology Charles Herndon — reported ties to Command Consulting Group, receiving $39,040 in income from the firm for consulting work performed during 2015 and 2016. 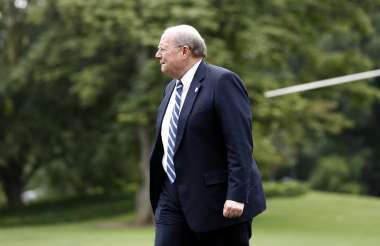 In a White House full of colorful characters, Hagin, who grew up in Ohio and is an experienced former aide to both presidents Bush, has earned few headlines. As deputy chief of staff for operations, a role he also played for President George W. Bush, Hagin reportedly controls the president’s schedule. He helped establish the Department of Homeland Security in the wake of the September 11, 2001, terrorist attacks, and in 2004, was rumored to be on the president’s short list to lead it. In 2009, after leaving government, he helped found Command Consulting Group. Bingel, a former chief of staff for U.S. Customs and Border Patrol, was also a founding partner. The firm lists several companies that make up Command Consulting Group, including CT Strategies, which, federal records show, has secured government contracts, including one this year for $6 million. The firm has also been registered to lobby the federal government on behalf of clients in the past, although Hagin himself has not. Command Policy Group, one of the companies listed on Command Consulting Group’s website, filed paperwork in January terminating its lobbying work for its most recent federal lobbying client, a manufacturer of high performance imaging devices called Perceptics LLC, as of the end of 2016. Hagin’s stake in Command Consulting Group was worth between $500,001 and $1 million, according to his federal personal financial disclosure form, and as a result of his resignation, he would be paid “the value of my capital account in the firm.” It isn’t clear from the form exactly how much that is. Hagin also disclosed earning $5,000 or more from a variety of business consulting clients, though Hagin doesn’t specify whether those companies were clients of Command Consulting Group or of Hagin himself. The client list included the Dallas County Community College District, which last year hired Command Consulting Group to help find an executive of public safety, according to a press release on the consulting firm’s website. The list also included private equity company Elliott Management, run by Republican megadonor Paul Singer; Emaar Projects, a development company partly owned by the government of Dubai; McMahon Ventures LLC, a company owned by Trump’s Small Business Administration Administrator Linda McMahon; and other government contractors and corporate household names, including Google Inc.